TRANSPORT for London launched the first of the new Class 345 Crossrail EMUs into service on June 22, running between London Liverpool Street and Shenfield. Set No. 345005 worked what is normally a driver training run for the launch – the 10.35 to Shenfield as a passenger train – giving east London passengers their first experience of the air-conditioned train that will replace services provided by the ageing Class 315 fleet. The launch was about a month later than planned, following extensive testing. No. 345005 has been built by Bombardier and is part of the Aventra family. When Crossrail – or to give it the correct name of the Elizabeth Line – opens through London in December 2018, the sets will be nine-cars long, but initially on Liverpool Street to Shenfield they will run with seven cars because of platform lengths. Over the next few months TfL Rail will increase the number of sets in service to 11 by September, which will substantially increase passenger capacity on the route. Unlike other EMUs, the Class 345s have three doors for each carriage to improve entry or exit times, the seven-car versions carrying around 1,200 passengers seated and standing, the nine-car sets 1,500 in total. At the time of the launch, TfL Rail had three sets available for traffic. Then in October, driver training will begin with the units between Paddington and Heathrow Terminal 4, ahead of introduction of phase two of Crossrail from May 2018. Use of the Crossrail tunnels under Central London begins in December 2018 with services formed of Paddington to Abbey Wood, Liverpool Street Main Line to Shenfield, and Paddington Main Line to Heathrow Terminal 4 diagrams. Through trains from Shenfield to Paddington are due to begin in May 2019, and in December 2019 services are extended to Reading, each phase providing new journey opportunities, and bringing relief to overcrowded sections of the Underground’s Central Line, while increasing rail capacity in the capital by 10%. 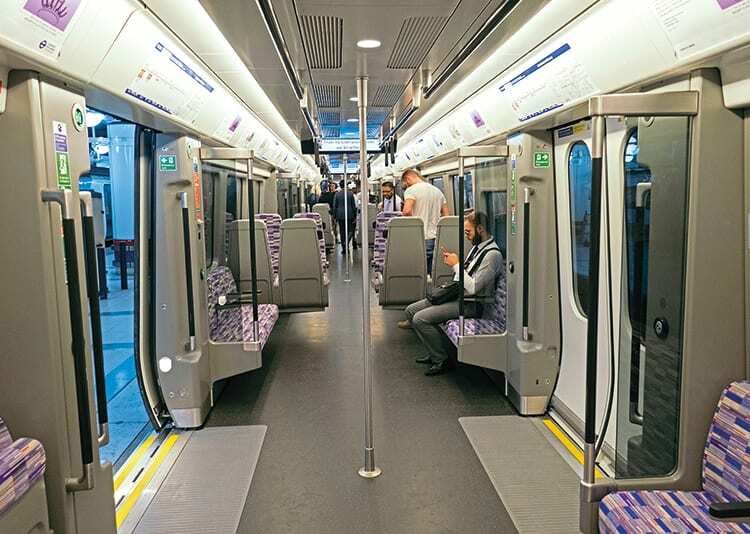 Mayor of London Sadiq Khan said: “I’m delighted that our first state-of-the-art Elizabeth line train has entered service. It gives Londoners a first look at a new service that will transform travel across London.